Home > Safety Signs > Mandatory Safety Signs > Manual Handling: Safety Signs & Warning Labels > Caution heavy unbalanced load when lifted label. Caution heavy unbalanced load when lifted label. Caution heavy unbalanced load when lifted label. 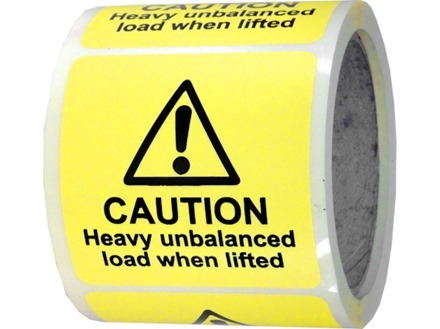 Part of our manual handling safety warning labels range, to advise handlers that the weight is not distributed evenly across the package. Supplied in rolls of 250 labels. Manual handling warning signs, notices and labels. 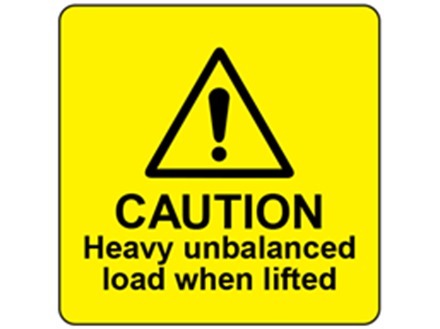 Caution heavy unbalanced load when lifted. Comply with Manual Handling Operations Regulations 1992, ISO 7010 and Signs and Signals Regulations 1996. Supplied in roll of 250 labels. MHL10001 Size 75mm x 75mm. Material self adhesive paper.